Posted: October 1, 2014 in Features, Who,What,Where & When...? 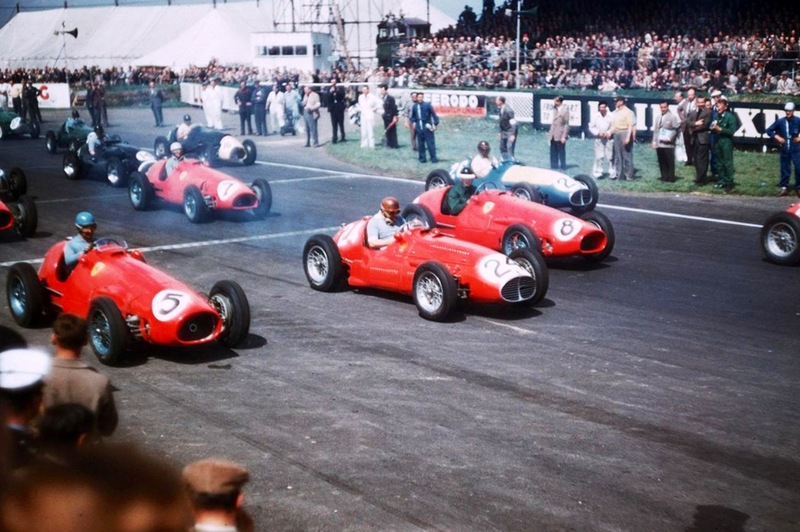 Hunts’ #2 Maserati 250F won the race from Davisons’ #4 Tipo 500 Ferrari with Neal #3 third in Hunts’ old Maser A6GCM. Thats Tom Hawkes in the ex-Brabham ‘Redex Special’ #7 Cooper Holden Repco making its debut with that engine at this meeting. Arthur Griffiths in the ex-Davison 1954 AGP winning #5 HWM Jaguar is on row two. Further back is Bill Wilcox in the ex-Jeff Scorer, ex-works/Gaze #9 Alta and Bill Craigs’ ex-Whitehead, Holden engined and rebodied # 11 Alta. 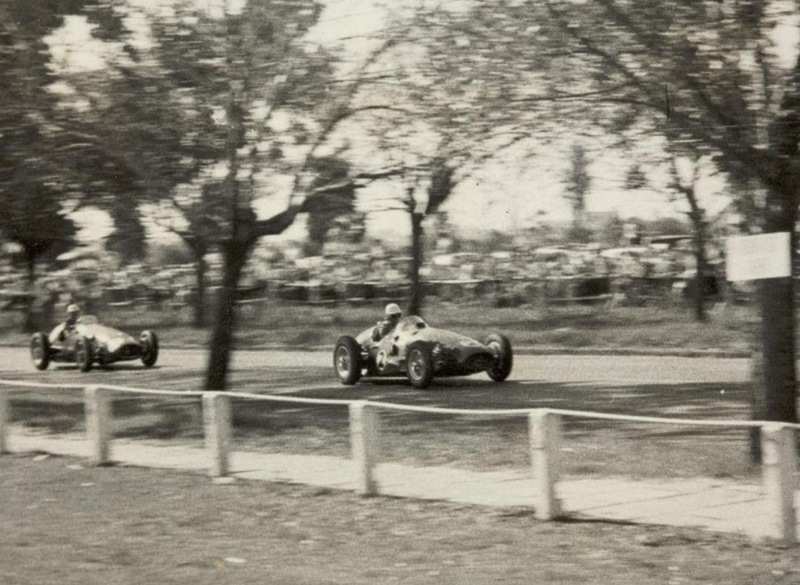 There were two racing carnivals at Albert Park in 1956. This ‘Moomba’ Meeting (Moomba is still a marvellous annual Melbourne late Summer festival) in March and the Australian Grand Prix meetings after the Melbourne Olympic Games in the last weekend of November and the first in December. Similarly, the ‘Moomba’ meeting was held over two weekends, race days were Sunday 11 and 18 March 1956. 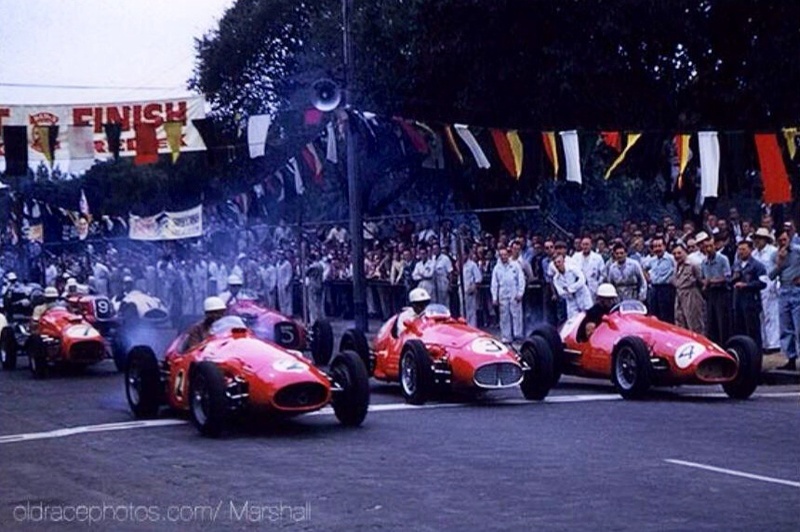 In many ways the image symbolises an era of single seater racing just underway in Australia, the dominance of the current ‘Red Cars’ from Italy ending a period when the Australian Special, and older ex-works European cars held sway. Barry Green in his wonderful book ‘Glory Days’, writes that their was a strong push to race at Albert Park in 1934. The Light Car Club of Australia, (LCCA) the promoter of race meetings at Phillip Island were aware of the ‘Islands growing unsuitability with its loose gravel surface as speeds increased. Extensive negotiations secured Albert Park as the venue for a race meeting to celebrate the Centenary of Victoria in 1935. Post war things were a little different and a partnership between the LCCA, the Army who had a facility at Albert Park, and Victorian Labor Senator Pat Kennelly were more successful. 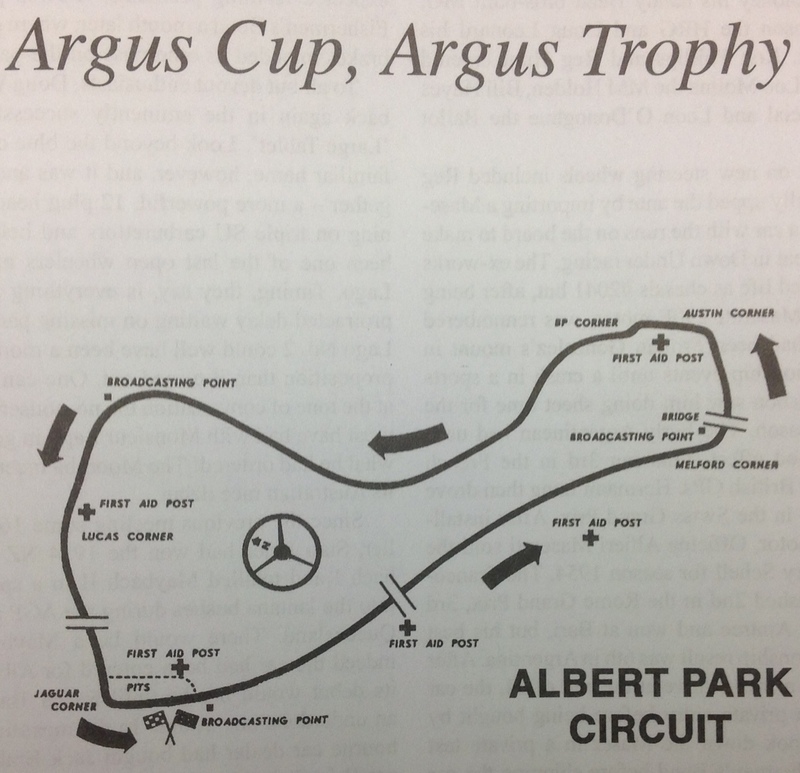 The three provided the combination of race organisation and promotional ability, logistical capability, the Army being able to ‘man’ Albert Park, a site of some 570 acres, and political power and influence. For all three groups the ability to raise funds in the aftermath of World War 2 was important. For the army funding for war widows and orphans, for Kennelly the ability to finance much needed improvements to the park to improve the local amenity for the working class community, and for the LCCA, the improvement of motor racing. His ex-Gonzalez Maserati A6GCM started life as 1953 2 litre chassis # 2041 but was renumbered # 2503 after a 250F engine was fitted for the new 2.5 litre F1 which commenced in 1954. Sold to Harry Schell for that season it arrived in Australia late in the year and was first tested by Hunt at Fishermans Bend before being raced at Ardmore for the 1955 NZGP where he popped it on the front row along with Prince Biras’ 250F. Bira lead the race from start to finish, Hunt fifth in a field which included the Whitehead and Gaze Ferrari 500/625’s. Hunt was stiff not to win the 1955 Australian Grand Prix in the A6GCM at Port Wakefield, a broken cam-follower slowing him and handing victory to Jack Brabhams Cooper Bobtail. Not to be outdone, and needing to remain competitive, Lex Davison, the 1954 AGP winner acquired his good friend Tony Gazes’ Ferrari 500/625, the car fitted with a 625 engine enlarged to 3 litres. These Lampredi designed, big-bore 4 cylinder DOHC engines a mainstay of Ferrari single-seaters and sports cars throughout the 50’s. In recent years, having passed into the ownership of the ‘Wheatcroft Collection’ in the early 60’s, the car has been identified as Tipo 500#5, Alberto Ascaris’ 1952 and 1953 World Championship winning chassis, the ‘winningest’ chassis of all time with at least ten Grands’ Prix victories…but at the time Davo had just acquired a competitive car which would be very kind to him in years to come. It was Lexs’ first meeting in the car, a change in gearing a mistake in set-up which blunted the cars performance, but the promise of the combination was undeniable. Having made such an impression with the A6GCM Hunt had no trouble convincing Maserati to part with a more recent mount, securing Jean Behra’s 1955 factory 250F, chassis #2516, the car winning non-championship Grands’ Prix in Pau and Bordeaux in that year. Hunt won both the feature racing car events of the Moomba meeting. Davison second in both and Neal third in one, DNF in another, in the car the Melbourne transport business man was to buy from Hunt. Before long Stan Jones also acquired a 250F, a more recent spec car than Hunts’. The mid-engined F1 Coopers were not far away, but for the moment, a wonderful era of modern ‘Big Front Engined Red Racing Cars’ had arrived in Australia…ending with the 1959 Australian Grand Prix, but we will come to that ! I understand that the “Jeff Scorer, ex-works/Gaze #9 Alta”, referred to in the paragraph below the first image, would be better described as the “Bill Wilcox ex Jeff Scorer, ex-works/Gaze #9 Alta”. Car #9 is certainly listed in the Official Programme as an Alta with JH Scorer as the Entrant & Driver. However the race report in Australian Motor Sports, April 1956, explains that the Alta was purchased by Bill Wilcox during the week before the Argus Trophy and mentions that it was driven by him in that race. Also, in his book Historic Racing Cars in Australia (1079), John Blanden states that the Tom Hawkes “Cooper-Bristol” was re-engined with a Repco Holden and that the new combination made its debut at the 1956 Argus Trophy. Thanks Rob, I was only talking to racer/restorer Greg Smith a week ago about my need for a collection of AMS! Thanks for your eye for the detail, I am concerned to be factually correct! Have a look at my recent article on the Moss 300S if you have a particular interest in Albert Park. My uncle was Kevin Neal and I just remembered today watching the Grand Prix and seeing the old photos that I googled the two and there he was on the frontline 1956. I think that was the year he broke both legs in an accident.